On Saturday, some nut killed a bunch of Jewish folks worshipping in a synagogue in Pittsburgh, Pennsylvania. Today, Vice-President Mike Pence is in Detroit, Michigan holding a campaign rally for a Jewish Republican named Lena Epstein. The distance between the two cities is about 300 miles, hundreds of precincts, and at state or two. Pence is an openly Christian man that attends Bible studies in the White House and is known to pray regularly. In the article below, Pence is getting slammed at a campaign stop for having the wrong kind of Jew pray at the campaign rally. Pence had Loren Jacobs pray twice at the rally, once in the beginning and again to close the campaign stop. Please note that the article posted below is a new article and not and opinion piece. 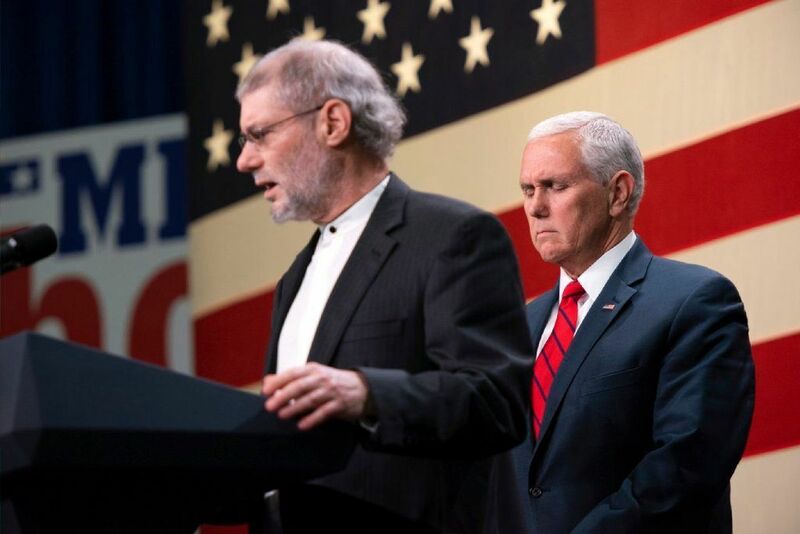 Instead of opening up with prayers for the 11 Jews shot dead Saturday at the Tree of Life synagogue, Jacobs praised Jesus Christ and then offered prayers for four Republican candidates. “I pray that you will enable Vice President Pence to fulfill his many and important responsibilities with excellence,” he added. As you continue in the article then you get to the real rub, which is that Loren Jacobs is a Jew by upbringing and a Christian by faith. “Messianic ‘Judaism’ is a branch of Christianity & offensive to the Jewish community. Lena Epstein knew this & so did Pence & his team. This wasn’t ecumenical; it was an insulting political stunt,” said Jason Miller, a Detroit rabbi, noting that there are more than 60 official rabbis in Michigan. The movement has the strong support of evangelical Christians, a corner stone of President Donald Trump’s and Republicans’ voter base. Trump’s lawyer Jay Sekulow is a senior figure in the Messianic Jew movement. “Stop pretending and appropriating my people,” she wrote online. How many Jewish Rabbis actually believe the Torah is the Word of God and authoritative in their lives? How many Torah believing Rabbis are registered to vote as Republicans? How many Torah believing Rabbis are willing to publicly endorse anyone or anything related to Donald Trump or Mike Pence? How many did so during the 2016 election cycle? How many of the above defined Rabbis live in Detroit? Thus this article is utilizing a strawman argument as a pretext for bashing Christianity. Oh, my Christian church prayed for the Jewish victims and their families at our Christian worship service the following day as did many millions of Christians across this nation and probably the world. Those making sour grapes about Pence’s campaign stop are not Republicans and would never vote for the candidates that were on the stage. This article is a political hit piece crafted on the eve of a close election.